Optoma India has been on a spree of new launches of projectors in India and recently, we saw the launch of Data Projector Series from Optoma. 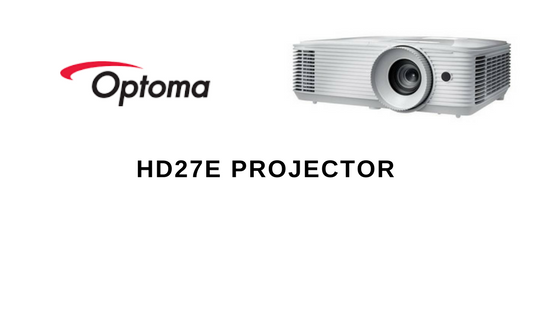 Today, Optoma HD27e is introduced with 1080p resolution, 3,400 lumens, and 25,000:1 contrast ratio. It boasts amazing Color technology and conforms to Rec.709, taking color accuracy a step further with true-to-life color reproduction. Convenient and easy to set up, Optoma HD27e is perfect for connecting a laptop, PC, Blu-ray player, media streamer or games console. It can even turn into a smart projector by connecting an HDMI dongle like the Google Chromecast™, Amazon Fire TV, or Apple TV™ to play games, stream videos, and share photos on the big screen. Featured with low input latency, Optoma HD27e provides gamers a smooth, responsive gaming experience. Optoma HD27e is priced at INR 99,840.